The creation of the Echidna Gorge in the Bungle Bungles (Purnululu) is described thusly in some oral histories: In time immemorial, the carefree lifestyle of the Echidna (tachyglossus aculeatus) irritated the Cockatoo so much that the bird hunted the Echidna through the scrub along a cliff wall and tore out some of its spines. 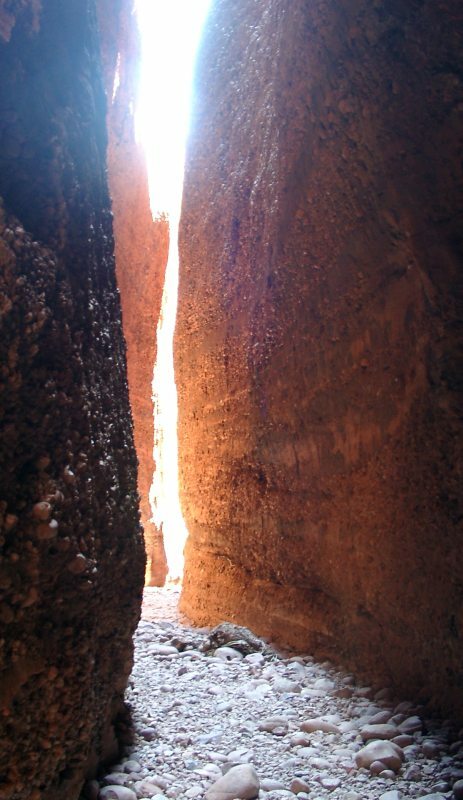 The Echidna pushed against a small crack in the cliff, which enormously increased in size, becoming today’s gorge, in which the Echidna found refuge from the Cockatoo. In pressed against the walls of the ravine, the Echidna’s spines were pushed rearwards, just the way they are today. Although, visually and conceptually, the paintings speak for themselves and are capable of casting their own special spell on the viewer, one can gain a better understanding of them if a brief look is taken at the many different facets of jukurrpa (2) – facets that are mutually related, interacting with each other and forming a highly complex system of ideas from the Aboriginal world view and religion. Jukurrpa manifests itself primarily in the Aboriginal ancestors who, in the distant past, travelled across the land, moulded the landscape, created man and his abilities as well as animals and plants and who eventually sank back into the land, became part of it and are still present today. Geographical features still mark episodes from these ancestral journeys, features which are often places of reverence and therefore under protection. The heavens, too, are populated by ancestors who came down to earth to share in the act of creation and who then went back to heaven again. The Aborigines have numerous song cycles and stories about the journeys and activities of their ancestors which connect remote parts of the country and thus different groups of people. In other words, each group with its own culture and language owns parts of a larger song cycle or longer story and is thus united with others in jukurrpa. 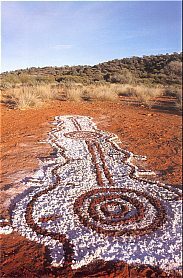 The ancestral activities and journeys come to life through the singing and dancing that are part of Aboriginal religious ceremonies as well as in their earth sculptures and sand paintings. The stories and song cycles contain the Aborigines’ knowledge about animals, plants, food, medicine and morality which enable human society and survival. They are not in any way mystical, but served the purpose of conveying knowledge and recording history. Even today, they have a very practical significance, serving as topographical descriptions of the country, helping, for example, to look for water or to find one’s way in the desert. But jukurrpa means much more. The Aborigines do not make a distinction between the spiritual and the material, the natural and the supernatural. Jukurrpa means both creation and the rules of interaction within society. It combines the past, the present and the future, with no hard and fast dividing lines between them. Man is part of jukurrpa, just as jukurrpa is part of man, his spiritual, psychological and material identity. Jukurrpa is both wisdom and existence. At the same time, it is the law, given to man by his ancestors. In this way, every natural and cultural phenomenon is related to all the others. Jukurrpa, the world view it expresses, the ancestral law, the stories and the concepts of the country – none of this is static. The new elements of the changing environment and the incidents that occurred when Aborigines were persecuted in recent history have become part of jukurrpa. For everything new is as old as the world itself, because it has always been part of the great design of jukurrpa. Every Aborigine possesses one or more jukurrpas or stories, inherited from their parents or grandparents. These jukurrpas are the spiritual link with a certain part of the country and, in many cases, a specific plant or animal. The country, jukurrpa, man and stories – including stories told through a painting – are closely connected: jukurrpa refers to the country which is part of a person and the stories which belong to the country. Jukurrpa is true. It is the real world as we experience it, but it is also the spiritual world behind it. Its strength consists of the combination of both – a strength that becomes visible in the art. They are powerful paintings, and regardless of whether they are sometimes more lyrical in style, with muted colours, or whether they are precisely dotted, with symbols that stand out distinctly against the background, they always convey a great presence and strength. The artists are inspired by their jukurrpas, and their art is therefore about the essential things in life which determine a person’s destiny both materially and spiritually. Jukurrpa unites the visible and the invisible. It is that inner quality which is shown to the outside, yet remains hidden. This can be seen on a variety of levels – in the stories, in the various planes of the compositions and in iconographic encryption. (2) Jukurrpa is the designation in the language of the Warlpiri people of central Australia. 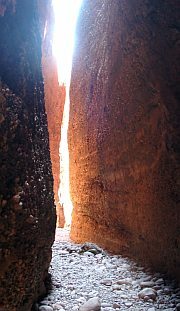 The Gija people from the Kimberley call it Ngarrangkarni, the Ngarinjin people - likewise from the Kimberley – use the term Lalai and the Arrernte people use Altyerre, Aleringa, Alcheringa or Aldjerinya.